Wow, this has been a while. Silence means not inactivity. So I’d like to give you some updates right now. I will start with this great movie “Passengers” by the Norwegian Morten Tyldum (director) and Jon Spaihts (writer) from 2016. To my extend this is a new landmark for future design and an example of dedicated craftsmanship in script writing. A limited cast with a great dilemma in existential scale. It has been a pleasure to be a part time space (and time) traveller while watching this movie with its superior production design. Guy Hendrix Dyas work is nominated for the Oscar 2017. He better be! I’ve been accompanied by 15 students of mine – they’ve been willing to give me their heart rate in exchange for the ticket. It was a kind of semester goodby as well. Their results are not yet evaluated. The raw data looks very mixed, as always. But because I’ve seen the movie twice, I’ve been curious to compare my first and second visit of the same movie. I felt very strong body reactions because of certain story incidents, as well as from the brillant sound. Did I mentioned the audio? Wow, terrific! I found an insight of the work of Will Files – one of the gifted audio folks involved. 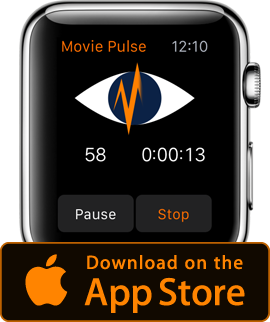 A short look at both graphs made available through my app Movie Pulse obviously confirmed my presumption. But that even the high and low peaks at the end match 100% is definitely by chance. I combined both graphs for better comparison. The impact after 1 hour has even been higher at the 2nd screening. Jim: There’s no secrets between us. Arthur: Is that the case? Because I have access to the raw data of the recordings on my research devices (which is not [yet] available at the official app at iTunes, because of privacy rules), I can get my hands on the data curves. I made two graphs, comparing both recordings. As always the data is now basis 0 at the average heart rate and normalized. There are a bunch of movies with a horseload of data waiting to be analyzed and evaluated. Among them the heart rates of 15 people watching this movie. Let’s see if I can find some more conformity comparing those, rather than my own visits. Dr. André Weinreich and me are almost done with the sessions in this semester. I will give you a follow up what happened the last months.